It was time for another foodcentric book club meeting. The assigned book was Sharks Fin and Sichuan Pepper by Fuchsia Dunlop. For some reason, I could not get into the book. I tried to read it on the plane; I tried to read it in bed, on the couch, and even outside. I got uncontrollable cravings for delicious, spicy, flavorful Sichuan cuisine, but couldn’t be forced to turn the page. The thought of skipping the book club never did enter my mind. 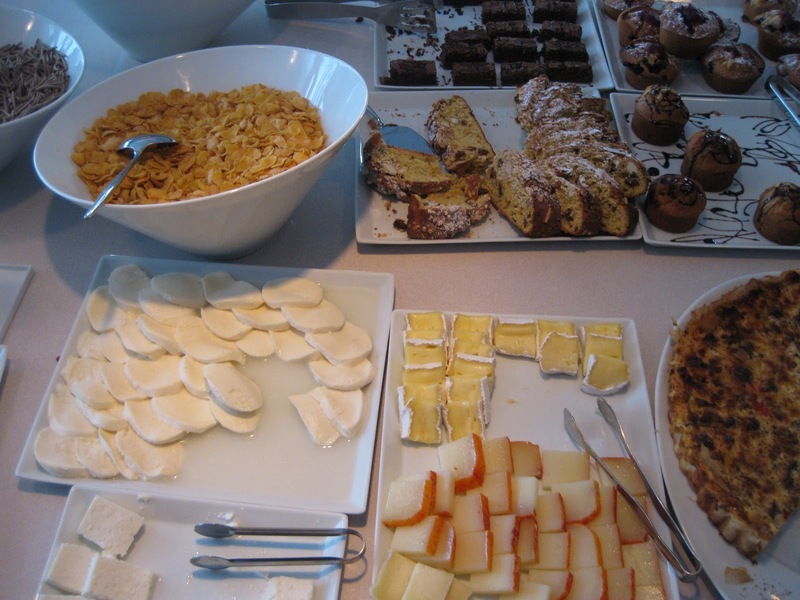 After all, one of the components of the club is the potluck where each attendee cooks or brings a dish inspired by the book. What to bring? I knew the hostess-with-the-mostest, Naomi of Gastrognome, would be making the Dan Dan Noodles, and there was some talk of grilled lamb skewers with cumin and stir-fried eggplant. I thought something sweet would round up the meal nicely. Unfortunately, the book itself did not have a dessert recipe, so I turned to the world of on-line research. 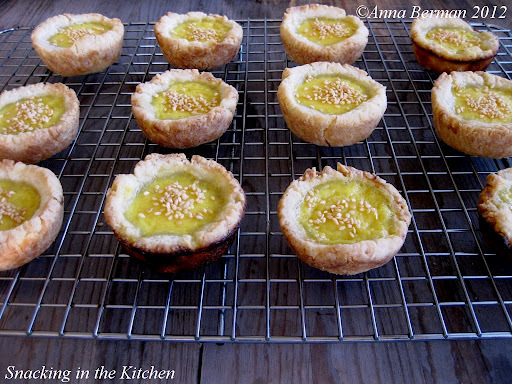 Googling “Sichuan dessert recipes” led me to the Rasa Malaysia site and a simple recipe for Portuguese Egg Tarts. 1. Preheat oven to 400. 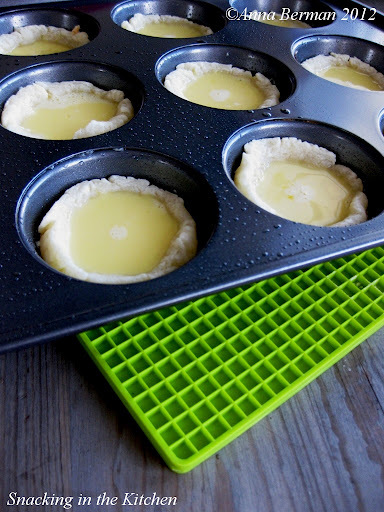 Spray a muffin tin with oil spray. 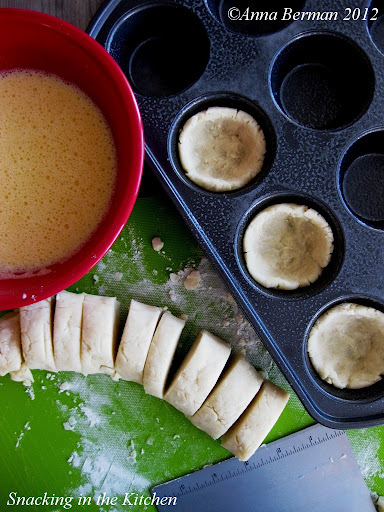 In a bowl, combine pie crust mix, water, butter, and sugar. 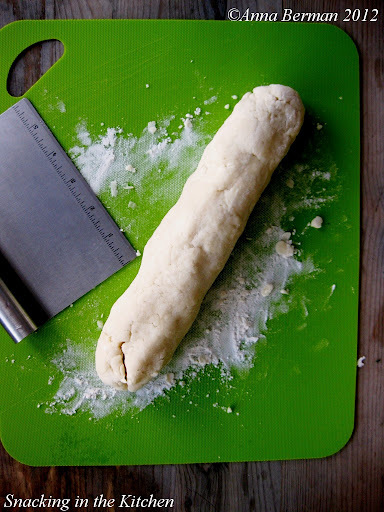 Roll the dough into a log on a floured surface, about 14 inches long. 2. 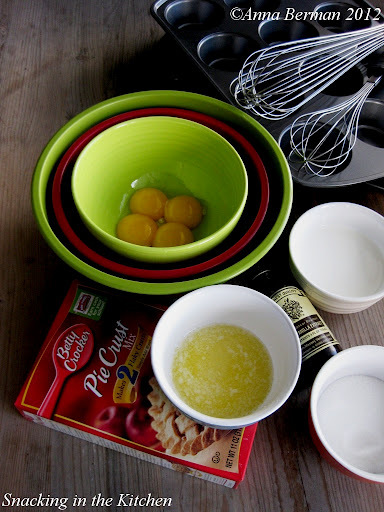 In a separate bowl, whisk together the filling ingredients. 3. Cut the dough log into 12 equal pieces. 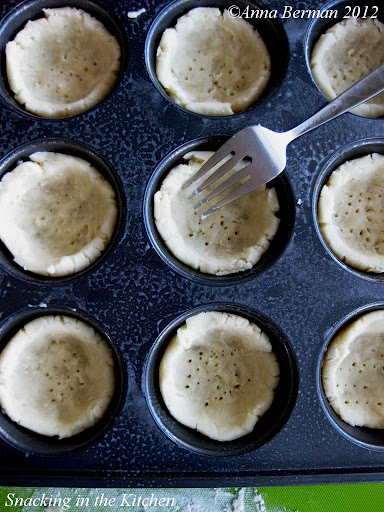 Place each piece on the bottom of the muffin tin and form a shell by gently pressing the dough into the bottom and the sides. Use a fork to make holes on the bottom of each crust. Bake the crust in the preheated oven for 5 minutes. 4. 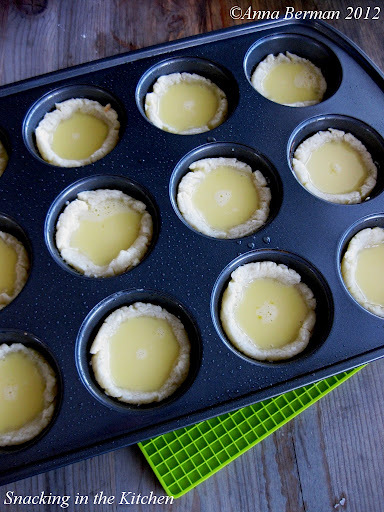 Remove the pre-baked crust from the oven and fill with the egg custard. You might have a little bit of the custard left over, depending on how high you make your crust. 5. 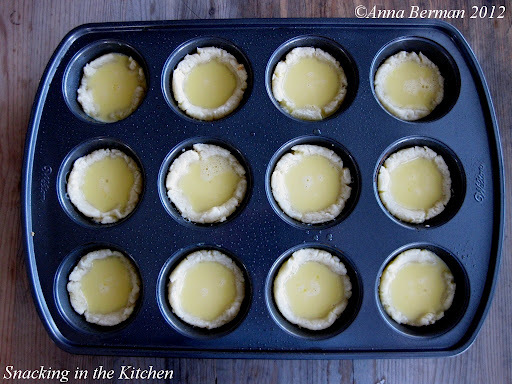 Place the tarts back in the oven and bake for additional 10-12 minutes, or until the crust is golden brown and the custard is set. 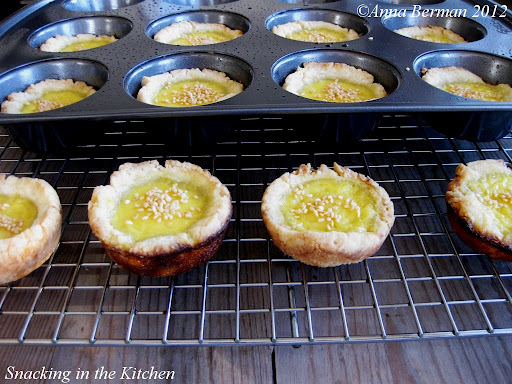 Remove the tarts from the oven and sprinkle with toasted sesame seeds. Cool the tarts on a rack. You are ready to eat now. I couldn’t resist and ate one of the tarts while it was still warm. The rest of the eleven tarts made it to the book club. 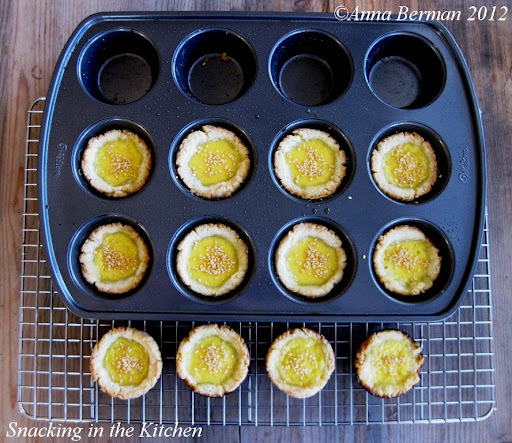 I was trying to figure out how to transport these golden sweets and came up with the idea of an egg carton – ha! It’s snowing today in Seattle and I’m reminiscing over sunny and slightly warmer days in Lisbon, Portugal. One of the joys of travels is discovering new culture, and one of the most delicious ways of doing it is through food! 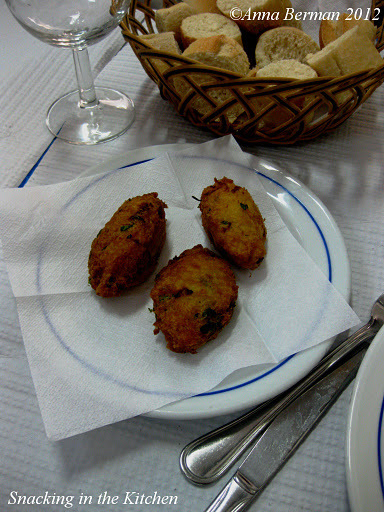 I wanted to share photos and thoughts of my culinary adventures in Portugal with you, dear snackers! 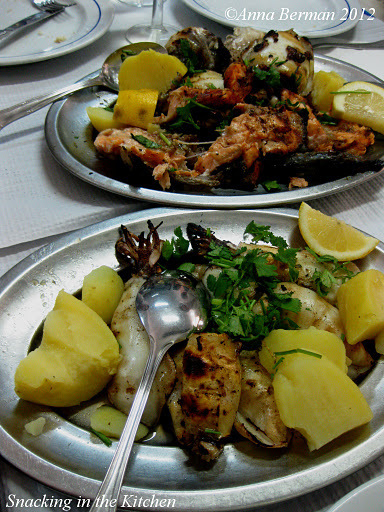 Portugal is famous for its seafood (proximity to the source) and Vinho Verde (fresh, slightly effervescent wine made from “green grapes”). 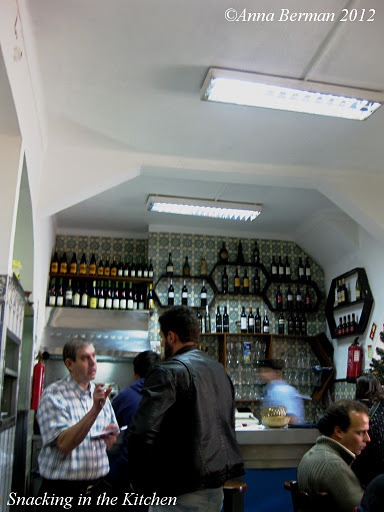 Our first meal in Lisbon was at a local restaurant, Restaurante Rio Coura, bustling with jovial chatter of the locals, clinking of glasses,and swishy sounds of paper table cloths turned over to greet new guests. 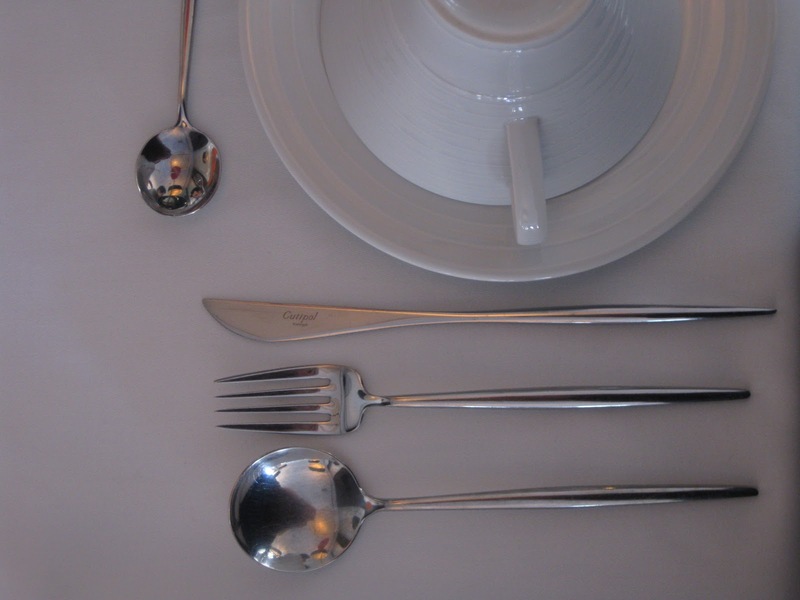 Unless you have a personal restaurant recommendation, picking a restaurant in a foreign country might be tricky. Don’t get sucked in by menus written in English or bored waiters standing on the street, begging you to come in and taste their delights. Instead, pay attention and find out where the locals eat! 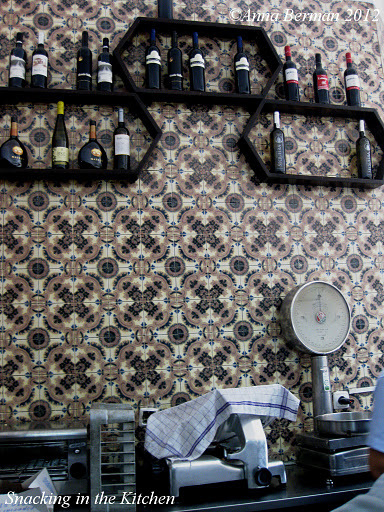 If at all possible, pretend you are Rachael Ray and ask the locals for a recommendation (skip your hotel’s concierge). 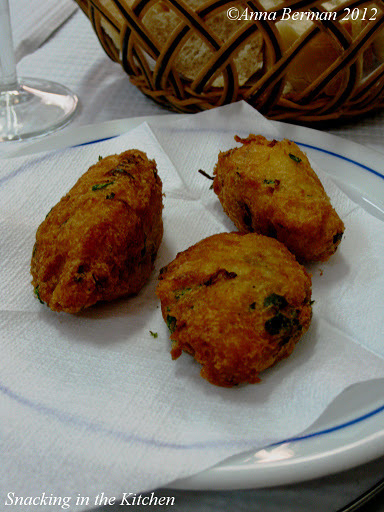 Our meal started with a basket of bread and Bolinhos de Bacalhau – Portuguese cod fritters. I’m not sure why, but the bread was stale. 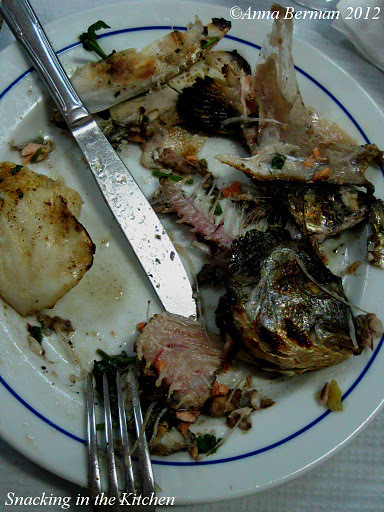 We sipped on a bottle of Vinho Verde and awaited the delivery of our main course. 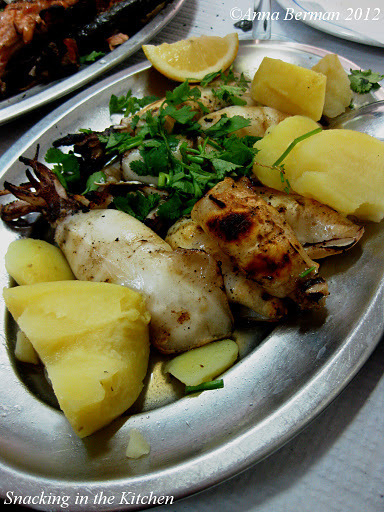 For the main course, we ordered grilled calamari and a mixed seafood platter. Talk about seafood delight! The calamari were some of the best I’ve ever tasted ~ no rubber here! Grilled to perfection, charred and tender, they were simply delicious. A healthy sprinkle of lemon went a long way. 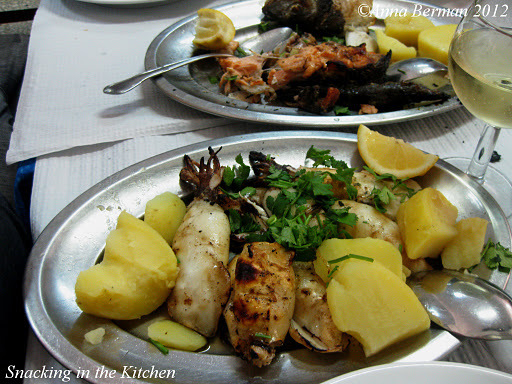 The seafood platter had a variety of fish (salmon and white fish), grilled calamari, and boiled potatoes. Nothing but the bones were left. Thanks for a delightful meal. Have you been to Portugal? If so, what was your favorite meal? You probably don’t want to be too hungry while looking at these photos. 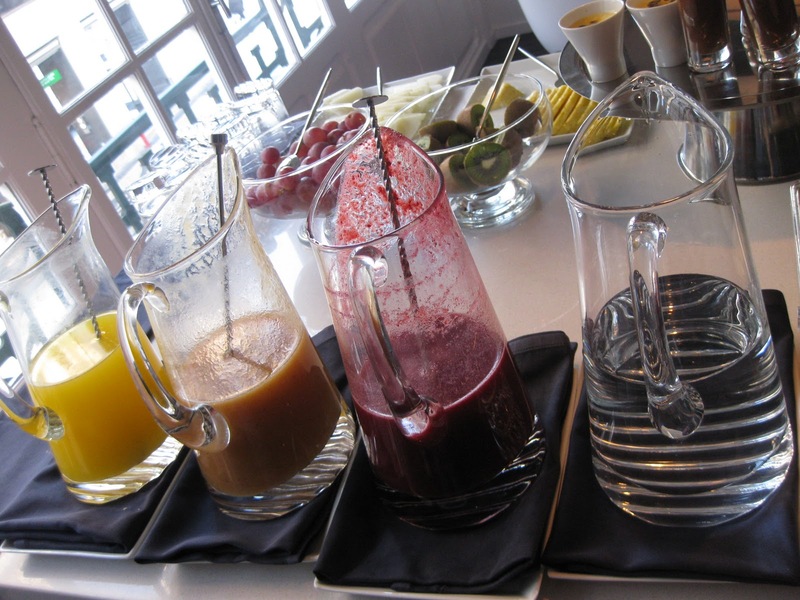 I snapped a few shots from our breakfast at the Internacional Design hotel in Lisbon, Portugal. 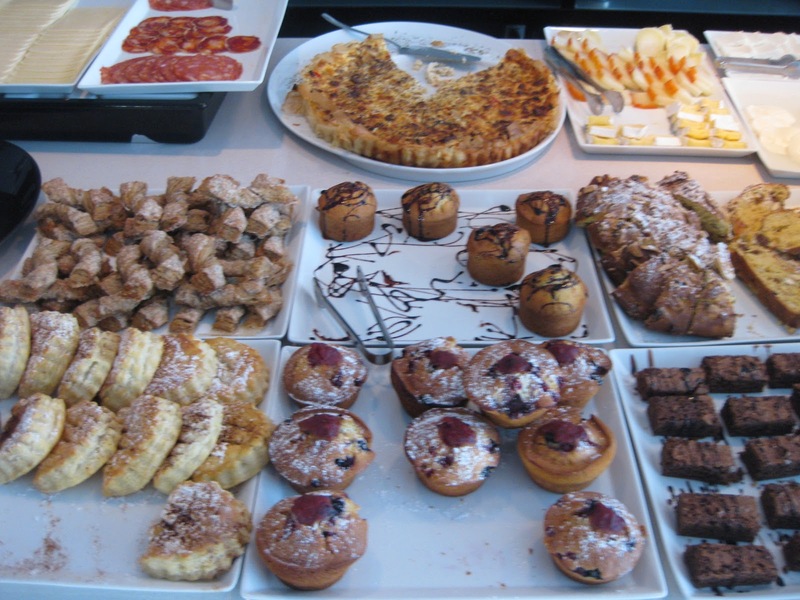 Mimosas, cold cuts, quiche, pastries, and coffee! Makes me one happy girl, and perhaps just a bit tired and hoping for a nap that is not going to happen. Notice the orange accents at the bar. I have to say, I haven’t seen that much orange everywhere in a long time. It makes me feel right at home.